Jai Jai Jai Bajrangbali, a new television serial on Sahara One Channel, is based on stories of Hanuman from various Hindu Scriptures. 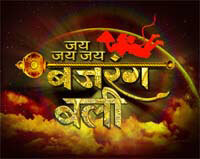 The serial will be telecast from Monday to Friday at 8:30 PM IST. Rudravtar of Lord Shiva, the destroyer and transformer among the trinities. Jai Jai Jai Bajrangbali is produced and directed by Sagar Arts.